What's going to happen to tariffs after Brexit? 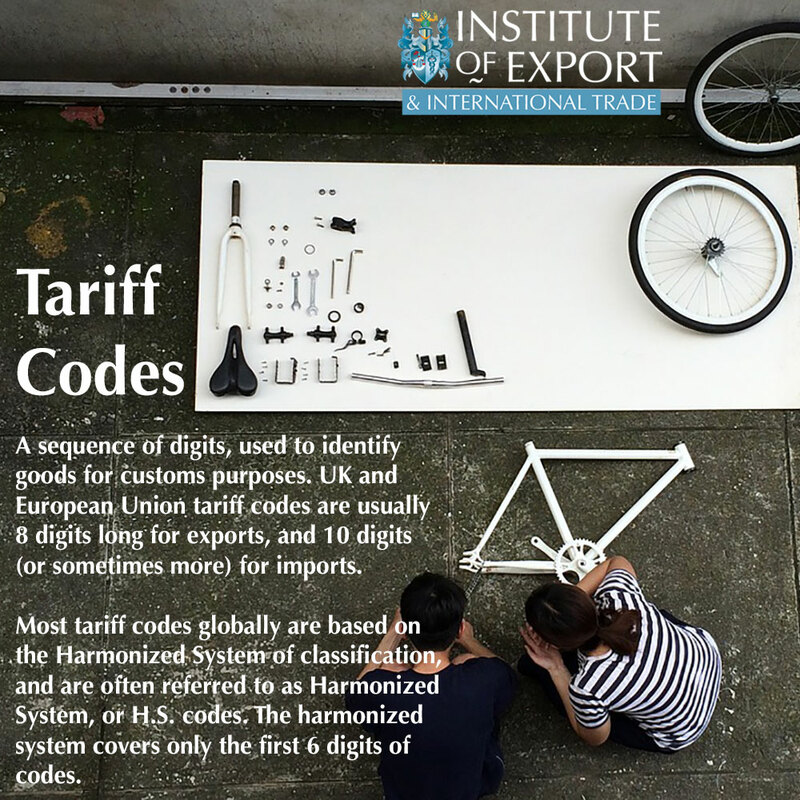 What are tariff codes and why are they important? Tariff codes are very important in international trade as they describe your product so that when they are shipped to overseas countries, local customs will be able to identify the product. They ensure that when goods are imported into any country the correct amount of duty and tax is paid by the importer, which has a huge impact on the landed cost of the product to the importer, who may then be selling your products onto other customers. In some countries, customs will also use the tariff codes to suspend duty on goods. They may use the code to identify preferential import quotas on products, which can benefit importers over a period of time or on a specific imported volume of product. The tariff codes will identify if any preferential duty rates can be applied, based on trade agreements negotiated by two countries or groups of countries. More importantly, the codes will also form the basis for the rules of origin, so that exporters and importers can see if their own products can comply with these rules and thus reduce import duties to their customers. Within these agreements, there are also special considerations for certain products to countries, which identify specific trade preferences, based on what the tariff code is. Tariff codes will also indicate whether you need to obtain an import or export licence - for example, plant and animal products on health and conservation grounds, or for firearms and hazardous materials. They also have a regulatory function, helping officials know whether excise or anti-dumping duties apply, where dumping relates to goods that are exported from one country to another at a lower than normal price. What's going to happen to UK tariffs after Brexit? On 24 July 2018 the United Kingdom submitted to the World Trade Organisation (WTO) a draft of new national schedules of tariffs to come into effect if or when the UK leaves the European Union. This will mean that the UK will be required to apply WTO rules to its trade with the EU as well as with other countries, if it is a hard Brexit. However, it is important to understand that under WTO rules do not determine duty rates, as governments apply duties to imported goods based on the benefits and support they want to provide to their own businesses - for example, to protect domestic manufacturers of products who are concerned about too much competition in the marketplace. If the UK takes control of their own tariff codes and import duties they will do so based on what the best scenario would be for UK companies, whilst maintaining acceptable rates for importers of such product groups such as food and medicines, which the country relies on. With a 'Hard Brexit', it is highly likely that the UK will maintain the same tariffs that are currently in place. The reasons for this are that it would be beneficial for the UK to stay in line with EU Tariffs in the event of any sort of future trade preferences being put in place; and with the signing of two continuity agreements with Chile and the Faroes Islands, as of 4th February 2019, the tariffs would need to remain the same to accommodate these agreements. In time the UK may want to change tariffs and import duty rates based on the benefits and support it could provide to UK business. If the UK did want to change the tariff then this would mean reviewing over 5000 HS code headings. At this present moment in time, it does not seem likely that they would embark on such a huge task.